This is a very common problem when your front load washer won’t drain and in most cases it’s very easy to fix. Most all newer model front load style washers have a “coin trap” or “pump filter” to catch coins, hair pins, and other types of debris. Over time all that builds up in the trap and it causes the drain cycle to take to long which in turn usually causes the computer on the washer to throw up the long drain error code and stop the cycle. So to fix it all you have to do is clean out the trap. 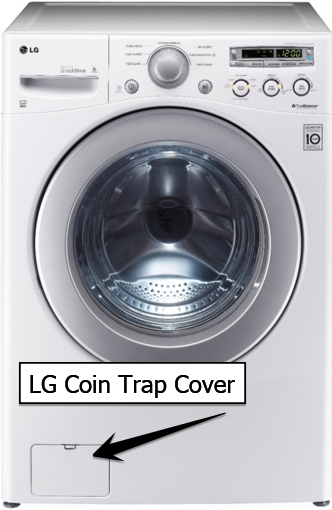 The placement of the coin trap vary from washer to washer but what you are looking for is a cover panel on the front bottom of the washer like the ones in the images below. However if your front load washer won’t drain and it does not have the cover on the front panel then you may have a bottom panel that will have to be removed from the washer to access the pump trap like some of the Whirlpool Duet Washers have. 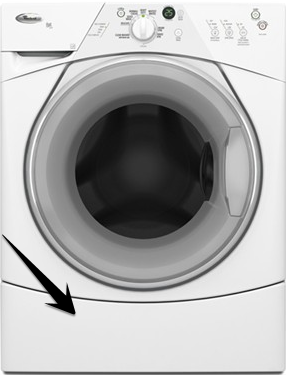 Some of the newer style Whirlpool Duet washers do not have the front panel and the pump trap is accessed from the back panel. 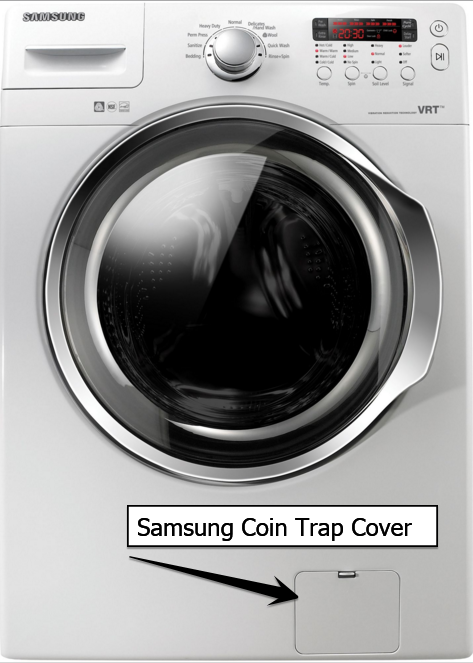 If your washer does not have the trap cover of the removable bottom panel then the entire front of the washer has to be removed to get to the coin trap. Once you have located the trap then you can simply unscrew the cap on the front of the pump assembly and clean it out I have posted a video below that will give you a pretty good idea what you need to do. If you have cleaned out the drain trap and your front load washer won’t drain and you don’t know what to do but want to fix the problem yourself we can help, click the live tech help button on the bottom right of your page or visit our tech help service page for more information.